Losing weight can be difficult, but with the help of our Garcinia Cambogia supplement with 95% HCA, you can supercharge your progress! Get slim by adding this amazing natural carb blocker to your daily supplement regimen, and watch the pounds drop. It is also an effective appetite suppressant to keep those pesky hunger pangs from distracting you. 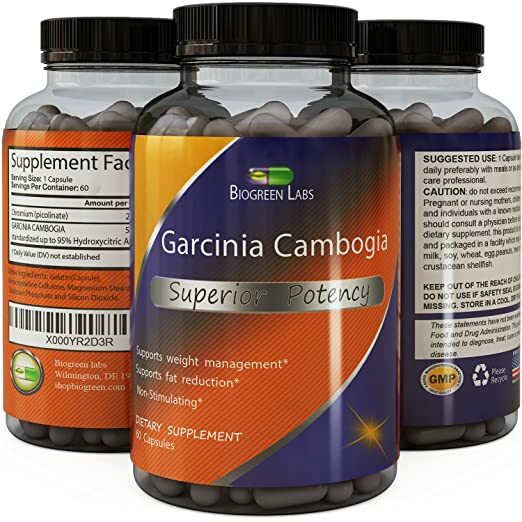 Biogreen Labs offers a wide range of dietary supplements for every health need, whether you’re trying to get in better shape or boost your energy levels. We use only the most pure, most potent and high quality ingredients available in our all-natural dietary supplements. We do this because we want our products to work for you time and again. We want you to be a customer for life! All of our products are manufactured in the U.S.A. under the strictest cGMP standards.